AC Tuition Contest: You Can’t Win if You Don’t Try - SchoolFinder.com! How does up to $5,000 towards your tuition sound? 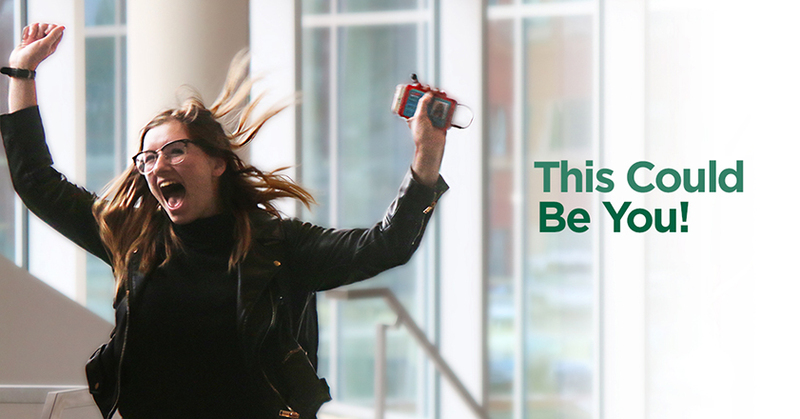 Make your dreams come true with the Algonquin College Tuition Contest. Picture this: you’re getting ready for the journey of a lifetime, college. You’re so eager to learn and experience so many amazing things. When suddenly it hits you: you need to pay for all this. Tuition is a buzzkill, but it doesn’t have to be. You could win up to $5,000 as a fee credit applied to your tuition. All you need to do is enter. When Madeleine found out she was a 2017 finalist, she was given two weeks to get the most votes on her entry video. “After the two weeks, I was asked to come to the College to meet with the other three finalists where it would be revealed who the winner was. I walked over to the AC Hub. I was completely shocked when I got up the stairs and saw that I had I won the contest!” You can watch Madeleine claim her prize here. Jack’s winning moment was equally sneaky, “[They] contacted my family and set up a big reveal of me opening a package that eventually said that I had won the contest while my family filmed my reaction.” Enjoy his moment of surprise here. It only takes a moment and a few simple clicks to change your life for the better. All you need to do to enter is explain, in 140 characters or less, what you want to change by going to Algonquin. It might not seem attainable, but someone has to win. Why shouldn’t it be you? Take a chance and enter today.